The Spy Game (real name unknown if there is one) is a great game for both winter and summer camping trips involving large groups of people. The game is played near a campfire, and the group is split into two. 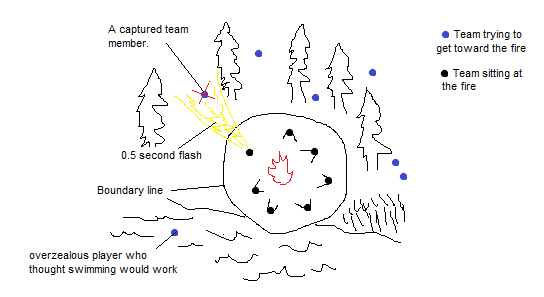 One team sits by the fire, and the other scatters through the woods to about 100m from the fire. The goal of the game is for individuals in the team scattered around the fire to join the group sitting by the fire, without being seen. This sounds impossible, but the team sitting by the fire has a few restrictions that makes catching these creepers pretty difficult. In order to see the members of the other team, you need to shine a light on them. Having only a half-second to do so makes it very hard to catch them. Basically, for the team sitting at the fire, all you have is your hearing, and whatever 6th senses you think you may have. As soon as you feel there is someone creeping up behind you, you have a half-second chance to turn around and shine your light. If you catch them, they are out. If not, you’re a sitting duck for 10 long seconds. Hopefully one of your teammates can cover your back. Different variations can be played where a caught player is still in play but needs to return to a starting point, or where a missed light doesn’t result in any time-outs. It’s up to you and your team to modify the game as you see fit. For the team creeping up on the fire, life isn’t so easy either. Any sudden movement and you’re bound to have 4 or 5 flashlights descending upon you. Moving around through the woods at night is also difficult (and loud!) and the closer you get the harder the game becomes. Worse, someone nearby who happens to sneeze, may get you caught without you even making a move. The game is over when either all of the team members creeping up are caught, a certain amount of time elapses (depending on which variation you want to play), or when someone makes it to the fire. Be sure to make it clear what constitutes making it to the fire by drawing a line around the fire area. This game is recommended for larger groups, but be careful when playing. Creeping around in the dark is obviously dangerous, and a really easy way to lose children if they’re playing too. Make sure the boundaries are clear, and that a headcount is made after each game.